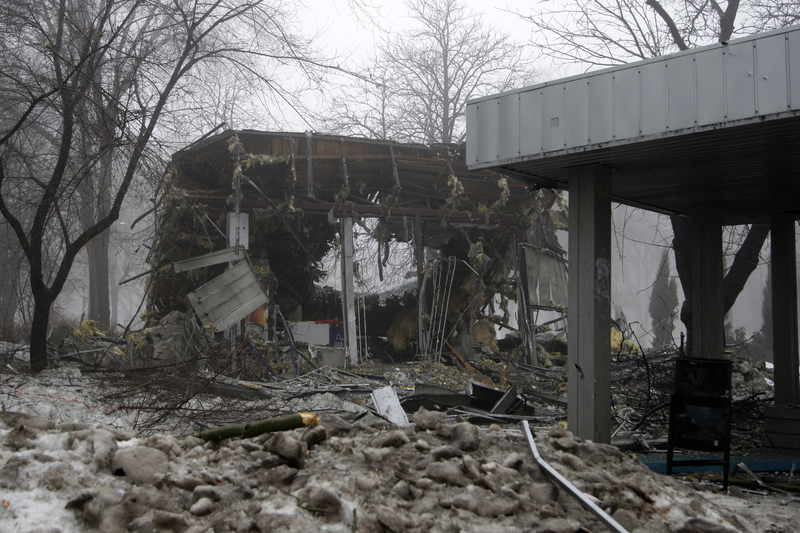 The war in eastern Ukraine will go on, despite the best efforts of the West and Kyiv to reach a negotiated settlement. For one thing, Putin’s proxies in eastern Ukraine are out-of-control warlords for whom war has become their only raison d’être. For another, Putin will want no permanent peace, as that would only stabilize Ukraine. A large-scale military assault aimed at capturing all of Ukraine, or even establishing a corridor from Russia to the Crimea, is probably out of the question, as the Ukrainian armed forces are strong enough to deter it. But low-level fighting of the kind that has characterized the Donbas for the last few months seems a sure bet. Equally likely is a continuation of terrorist attacks within Ukraine, which Ukraine will survive while Putin’s reputation as an exporter of terrorism will only grow. Ukraine will continue to insist that the Russian-occupied territories are occupied only “temporarily,” and Russia will continue to insist that its war against Ukraine is really only an internal Ukrainian squabble, but the end result of Russia’s continued occupation of both the Donbas enclave and the Crimea will be the continued, if uneven, consolidation of Russian rule. Faced with tough economic circumstances at home, Kyiv will continue to reduce its economic relations with, and financial subsidy of, the occupied territories. The burden of supporting the increasingly desperate inhabitants will fall on Russia, which will have to decide whether it prefers to make hay from a humanitarian catastrophe of its own making or actually to help save the victims of its imperialist policies. My guess is that Putin the great humanitarian will opt for catastrophe. [If Poroshenko] is counting on Russia to succumb to Western pressure and low oil prices and give up, he has to intensify fighting in a war he cannot win. That is an extremely risky bet, since Russia can take an inordinate amount of pain as long as its people continue to believe Putin’s cause is just. Poroshenko’s success is also predicated on Western nations’ acquiescence in being dragged deeper into the conflict, because for Ukraine to hold out even a few months, it needs better weaponry. Yet, like Putin, the Ukrainian president can’t afford to give in: He would be swept away in a tide of protest, led by fighters returning from the front lines. Ukraine faces an acute economic crisis that represents no less a threat to its survival than Russia does. Kyiv has come to rely on assistance from the International Monetary Fund and Western donors to survive; yet the Western commitment to support Ukraine financially is limited. Indeed, Moody’s has recently warned that Ukrainian default is very likely, pointing out that the country’s current bailout package provided by the IMF, EU and other donors is not sufficient to cover $10bln external debt repayments that come due this year. The Economist suggests that Ukraine needs an additional bailout of $20bln, noting that despite chatter about a “donors conference,” no government seems willing to put up the money. All of the obstacles to bailing out Ukraine remain. Western institutions won’t lend Ukraine the money it needs without imposing strict conditions, and the Ukrainian government cannot meet those conditions without wrecking itself politically. If the money were “found” to give to Ukraine in the absence of significant reforms, most of it would likely be lost to corruption or sent on to Russia to pay Ukraine’s debts. That would be a waste of funds, and even when there are strings attached there is not much interest in Western capitals to provide a lot of aid. Western governments decided over the last year that Ukraine wasn’t worth very much to them, and under the circumstances it’s hard to fault them for reaching that decision. On at least two occasions, [the sanctions] have caused Putin to scale back aggression in Ukraine — in May, when a threat to broaden sanctions pressured Russia to drop opposition to Ukraine’s presidential election, and again last fall, when a Russian military buildup and rebel plans to take three Ukrainian cities evaporated. Just as important is that exacting a price from Russia for its military aggression unites the EU behind the vital security interests of at least four members — Poland and the three Baltic states. The measures also serve as a financial disincentive for Putin to embark on military adventures beyond Ukraine, and they erode support for him among neighbors such as Belarus and Kazakhstan, now alarmed about what Putin may intend for them. Both men were found guilty of stealing 30m roubles (about £334,000 under the current exchange rate) from the French cosmetics company Yves Rocher. Asked by the judge, Yelena Korobchenko, if the rulings against them were clear, Alexei replied: “Nothing is clear. Why are you imprisoning my brother? By this you punish me even harder.” … “Of all the possible types of sentence, this is the meanest,” said Alexei Navalny outside court after his brother was taken away. “The government isn’t just trying to jail its political opponents – we’re used to it, we’re aware that they’re doing it – but this time they’re destroying and torturing the families of the people who oppose them,” he said. Putin’s calculus in holding Oleg Navalny hostage is as transparent as it is ruthless. He wants to crush Alexei Navalny, whom he sees as representing one of the last substantial, internal political threats to his rule. And he wants to do it with cruel, brute force. But he does not want to make Alexei Navalny into a martyr by giving him jail time or worse. Putin’s solution is to release Alexei from prison — he was also convicted today, but his sentence suspended, freeing him on house arrest after a year and a half in prison awaiting trial — but then punish Alexei by locking up his innocent brother. Think about that for a moment: Alexei Navalny’s only real crimes are organizing anti-Putin protests and running for Moscow mayor on an anti-Putin platform. Putin punished him with a year and a half in jail and now by locking up his innocent brother to intimidate him into silence. The punishment is also designed to send a signal to the Russian opposition more broadly: this is what happens. You are putting your closest family members at risk by speaking out, so shut up. While the suspended sentence may seem like Navalny was getting off with a slap on the wrist for standing up to Putin, in reality, the felony conviction means he’s barred from running for public office for a decade after he’s done serving his term — thus, essentially eliminating one of the main viable opposition candidates. He won 27 percent of the vote in Moscow’s 2013 mayoral election, coming in second. Navalny describes himself as a nationalist democrat, and his ideology can be a bit difficult to place, beyond being anti-Putin. Though he has earned comparisons in the international media to figures ranging from Julian Assange to Nelson Mandela, there’s a bit of Pat Buchanan mixed in there as well. Navalny has called for Russia’s liberal opposition to unite with far-left and far-right groups who share an antipathy to Putin but have very different ideas about who or what should replace him. He has unapologetically appeared at rallies with ultranationalist, xenophobic groups. He was expelled from Russia’s largest liberal party, Yabloko, over his nationalist ties in 2007. Fellow members of the opposition have also accused him of intolerance to criticism and compared his occasionally hectoring, macho tone to that of Putin himself. But the fact that Navalny is difficult to pigeonhole is probably a large part of his appeal: He’s a street activist and a savvy political campaigner at the same time and is just as comfortable talking to Russian nationalists as with readers of the New York Times. Despite Navalny’s bravery, today’s protest was not big enough to make the Kremlin truly worried. Police were in full control, detaining 117 people. Putin will probably crack a smile when he hears his aides’ report of the tiny rally. He will see his chosen tactic as successful, and he seems intent on keeping Navalny out of jail despite his escapade today. Why make him a martyr if a few thousand active supporters are all he can muster? And, once emotions cool off, won’t he have to think about his brother? Inside his feudal kingdom, Putin’s is waging the same kind of hybrid war as in Ukraine: a combination of psychological pressure, old-fashioned brute force and information trickery. So far, his enemies are much weaker, but continuing economic problems may mean someday — although likely not soon — Putin will meet his match, and the opposition, remembering all his dirty tricks, will take no pity on him. Previous Dish on the Navalny saga here. 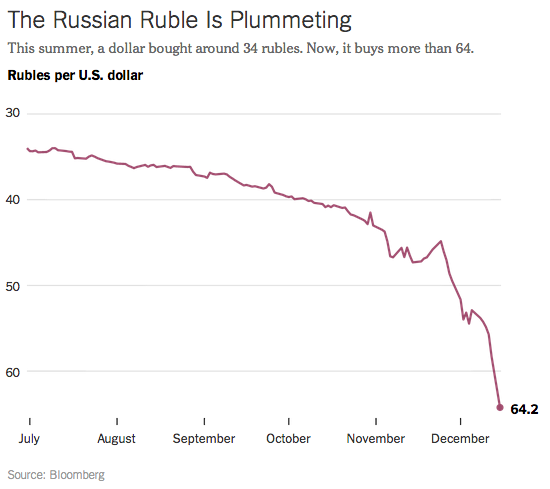 But weighing most heavily on the minds of everyone in attendance was the ruble’s recent downward spiral. At the Wednesday low, one U.S. dollar was buying 79 rubles, though the free-fall appears to have stabilized. For some, Tuesday’s value drop called to mind a similar incident 20 years ago, now known as Black Tuesday. He attributed a significant portion of these ongoing economic woes to Western sanctions, introduced in part because of his annexation of Crimea. But the president also told Russians not to worry, assuring them that the economy would rebound. (Indeed, the ruble was up to 61 to a dollar during his address.) “Our economy will overcome the current situation. How much time will be needed for that? Under the most unfavorable circumstances I think it will take about two years,” he said. Insofar as Russia’s fate depends on what happens to the oil price, Putin’s guess that things will pick up by the end of 2016 is as legitimate as anybody else’s. While he was speaking, the Saudi oil minister, Ali al-Naimi, was also saying, in Riyadh, that the current collapse would prove to be temporary. But Putin’s claim that, by the end of 2016, Russia will have successfully diversified its economy beyond energy is hopeful, to say the least. Indeed, a bit later in his press conference, when a reporter from Pravda asked about the country’s “oil addiction,” he acknowledged as much. “We are trying to create more favorable conditions for the development of production, but it is moving forward with difficulty,” Putin said. A prominent political observer and professor of National Research University Higher School of Economics, Vladimir Ryzhkov, summarized Putin’s statements for The Daily Beast: no plans for new reforms, no radical changes of staff or re-appointments. Not a word mentioned about the crazy growth of prices and public poverty. Why did Putin not give Russians any comforting promises? “Because he is waiting for oil to become expensive again, and everything to go back to normal soon. He does not have a clear understanding of how deep the crisis is—that’s why he is afraid to make any abrupt moves,” Ryzhkov said. Meanwhile, Russia is sinking ever deeper into its economic morass. If OPEC continues to support the oil glut — and they’re probably going to keep up pressure on Iran, now that the West has backed away from sanctions — the ruble won’t recover for years, and in the meantime Russians will have to live with stagflation at best. Putin gets job-approval ratings in the 80s now because he’s seen as responding to Western aggression, and because the conditions haven’t dragged out for very long yet. Eventually, Russians will start asking themselves whether Crimea and eastern Ukraine are worth the dissipation of their life savings, and the answer will increasingly become no. Putin wants two years for Russians to wait for a light at the end of the tunnel. That’s a very long time, even for an oligarchical autocrat, to keep the hoi polloi in line, let alone the oligarchs themselves. The latest news is that Russia’s banks are about to get bailed out to the tune of $16.5 billion. That became inevitable once the interest rate they charge each other on short-term loans—which shows how much they believe in each other’s solvency—shot up to 28.3 percent on Thursday, higher than it was even during the 2008 crisis. And, to give you an idea how big the black hole in Russian bank balance sheets must be, this is all happening despite the fact that the central bank just said that banks could pretend that they don’t have losses. Okay, it didn’t exactly say that, but close enough. Specifically, Russian banks can stop marking their losses to market, and use the old exchange rate to calculate the “value” of the assets on their books. Potemkin balance sheets, though, aren’t enough to fool the bankers themselves. They know how broke their banks are, so they don’t trust any others. The Russian government hopes that injecting this $16.5 billion into the banks will be enough to end this credit crunch. We’ll see. That’s money that Russia is going to start running out of. Beyond his usual accusations that Russia’s neighbor got into trouble because it invaded itself, he called for a quick political settlement that would restore Ukraine as “a single political space.” Later in the speech, Putin — prefacing his comments with “I’ll say an important thing. Look, I’d like everyone to hear this” — said that the rebels were part of the problem. He said that at the last peace deal in Minsk, they refused to sign crucial protocols the defining cease-fire lines. He also said he believed Ukrainian President Petro Poroshenko genuinely wants a deal. So Russia’s leader, not for the first time, is offering himself as peacemaker. (In his words, an intermediary.) The question for Ukraine, the U.S. and Europe is whether he means it. #Russia ruble now beats #Ukraine hryvnia as world's worst performing currency in 2014. There's a certain irony in that. Once the markets lose confidence in a currency, interest rates are no longer an effective policy tool, and foreign-exchange reserves can be depleted at an alarming rate. The reason is found in simple arithmetic. Even if the Russian Central Bank were to raise rates to a hundred per cent, which is obviously out of the question, the weekly return on ruble-denominated assets would be less than two per cent. In the midst of a panic like the one we are seeing now, a currency can plummet by five or ten per cent in a single day, thus erasing even ultra-high interest-rate yields and leaving holders of the currency with a big loss. Foreign-exchange traders know this all too well, and that’s why they still refuse to buy ruble-denominated assets. Russia has gone from not having an economy and 10.5 percent interest rates to not having an economy and 17 percent interest rates. That should be enough to turn its recession into a full-on depression — and make all of this self-defeating. Think about it this way: Russia’s central banks already says its economy will shrink 4.5 to 4.7 percent next year — about as much as the U.S. did in 2008 — if oil stays at $60-a-barrel. But now that interest rates are sky-high, nobody’s going to want to borrow, either. The economy, in other words, is going to crater as households hunker down and just try to survive the double-digit inflation that the crashing ruble will bring. [O]n Tuesday afternoon, after the ruble had fallen again to a stunning 80 to the dollar, the head of the central bank, Elvira Nabiullina, made a statement: “We have to learn to live in a new zone and count more on our own sources of finance,” she said. What? Ordinary Russians should read Nabiullina’s statement as, “Get used to being at least twice as poor next year as you were before the annexation of Crimea,” says Vladimir Ryzhkov, a prominent Russian politician and professor at the National Research University Higher School of Economy. “Now Russia does not have enough dollars to pay back billions of corporate bank debts; the payment is due before the new year. In the coming year, prices will continue to grow: Most medicine, which is mostly imported, will grow twice as expensive, as well as all electronic equipment—fridges, iPhones, computers and so on,” Ryzhkov told The Daily Beast. Putin’s successful statecraft has alternately consisted of bullying and defiance (Western Europe, the U.S.), invading neighbors (Ukraine, Georgia), depriving others of energy resources (Ukraine again, Eastern Europe), winning prestigious events through the promise of large investments (the 2014 Winter Olympics, the 2018 World Cup), forging relationships by offering sweetheart resource deals (China), or currying favor by allowing oligarchs to funnel huge quantities of money into real estate and banks (England, Turkey, Greece.) The currency markets can’t be bought off though. They are faceless, merciless, and swift. Every day, they are in effect passing judgment on regimes around the world. As the economy sinks, Putin will only become more reliant on these sorts of shenanigans he’s used previously to stay in power. He’s not just worried about his popularity, after all, but his very legitimacy as the head of state; the 2012 election showed him that Russians could turn against him. Putin has little choice, then, but to seek legitimacy by stirring up more crises abroad, positioning himself as a nationalist hero leading the brave Russian state in a hostile world. But the only way he can maintain that image at home is if his soft conflict with the West continues. Putin can’t deescalate tensions in Ukraine and more broadly in Europe because those tensions are just about all he has left. More broadly, the obvious move here is for Putin is to blame his country’s falling economy on American and European imperialism. By playing up the role of outside hostility in Russia’s economic crisis, Putin would shift the blame and, just as important, promote the idea that Russians have to come together and endure the downturn as a matter of national mission against a foreign enemy. There is one other alternative that the Dark Genius of the Kremlin may be turning over in his mind: Is there some way Russian foreign policy could create a Middle East crisis that would drive oil prices back up into the stratosphere? The most obvious way would be to bring about some kind of situation involving the Iranian nuclear talks—perhaps by offering quiet support to Iranian hardliners, increasing the chances that the talks fail. Any kind of serious war scare in the Persian Gulf would be good for Russia’s financial situation; Russian foreign policy experts are presumably thinking through their options. [T]he best thing the West could do now would be to lift the sanctions unconditionally. A Western leader, perhaps German Chancellor Angela Merkel or even U.S. President Barack Obama, could go on TV to say, “We stand with the Russian people in its hour of need. We support Russia, we want it to be strong and prosperous, and we have no intention to push it around.” That would leave Putin naked, faced with a weakening economy that rejects his management methods and a population increasingly wondering why it needs Putin and what he stands for anymore. That, however, is another fairy tale. Obama will soon sign legislation calling for tougher sanctions, giving Putin more ammunition in his intensifying fight for power, and also feeding more radical nationalist elements that consider even Putin too weak in defending Russian interests. Western leaders lack the imagination to deal with the Putin problem creatively, and they are loath to admit mistakes. They will keep adding stones to the soup. Obama is making a mistake by signing this bill. In addition to creating a pretext for more aggressive moves by Russia, signing this legislation will exacerbate Russia’s growing economic problems, and that will adversely affect the economies of Europe even more to the detriment of the U.S. and our allies. This could hardly come at a worse time when it appears that there is a good chance of having a genuine cease-fire in the Ukraine conflict. Piling on additional punitive and hostile measures now risks jeopardizing that fragile truce. It certainly isn’t going to make Moscow more accommodating or inclined to compromise. On the contrary, this is sure to make Russia more combative. The sanctions that the U.S. and European Union imposed earlier this year to dissuade Putin from further aggression made it hard for Russian companies to borrow on international capital markets; triggered large-scale capital flight (an estimated $130 billion this year); and shriveled inflows of foreign investment. Since then, they have acted as a multiplier on falling oil prices. The mere promise of lifting sanctions would begin to change sentiment in the currency markets. Once that happens, Russia’s central bank would be in a better position to intervene by buying up rubles — going with the tide instead of against it. Putin would, without question, come under attack from nationalists for betraying the rebel cause in Ukraine. Yet the authorities in Kiev are under even more economic duress. The U.S. and EU should use their leverage to get Ukraine to a deal that secures the country’s independence while meeting some of Russia’s demands. Russia’s central bank raised interest rates from 10.5 to 17 percent at an emergency 1 a.m. meeting in an attempt to stop the ruble, which is down 50 percent on the year against the dollar, from falling any further. It’s a desperate move to save Russia’s currency that comes at the cost of sacrificing Russia’s economy. But even that wasn’t enough. After a brief rally, the ruble resumed its cliff-diving ways on Tuesday, falling another 14 percent to a low of 80 rubles per dollar. It was 60 rubles per dollar just the day before. The problem is simple. Oil is still falling, and ordinary Russians don’t want to hold their money in rubles even if they get paid 17 percent interest to do so. In other words, there’s a well-justified panic. So now Russia is left with the double whammy of a collapsing currency and exorbitant interest rates. Checkmate. Perhaps the higher interest rates will make those moving money out of Russia think twice, and a resulting reversal in currency markets will lead speculators to conclude that betting against the ruble is no longer a sure thing. But the move shows how Russian policy makers are stuck with no good options. Already the central bank has reportedly been intervening to try to short-circuit the sell-off, buying rubles to try to arrest the declines. The problem is that if you try to defend your currency and lose, you are essentially throwing your money at currency traders for nothing. As Russia has deployed its reserves to (so far unsuccessfully) stop the currency collapse, it has made traders betting against the ruble richer while leaving the Russian government poorer. Poorer by $80 billion, to be precise. The collapse in the value of the ruble is a disaster for Russians who have debts denominated in foreign currencies, but it’s not necessarily the worst thing in the world for those who don’t. Indeed, Russians working in tourism (which, admittedly, isn’t that many people since Russia is mostly cold and empty) or in the country’s handful of export industries that aren’t oil and gas actually benefit from a cheap currency. Conversely, much higher interest rates will be devastating to the fortunes of Russians who need to roll over ruble-denominated loans or who depend on rate-sensitive sectors like construction for their employment. If the regime cannot stage a satisfactory bit of theater, then the remaining options are uglier. Putin could deliberately try to provoke the West in the hopes of blaming Russia’s economic troubles on foreigners. Or he could turn force inward against internal “enemies” of Russia. Or the regime could hand Putin’s head to the mob without a clear plan for succession, leading to a period without clear leadership at the top until someone emerges from the internal struggle for power. Least likely of all would be a genuinely revolutionary situation such as obtained in 1991. None of Russia’s organs of power are willing to take that kind of risk again. Putin can’t do much of anything about oil prices and any steps to cooperate with NATO to secure sanctions relief will make him look weak. There’s a fair chance, then, that he may actually escalate tensions to get back the rally-round-the-flag effect that has sustained his popularity through the Ukraine crisis. Russian jets continue to buzz the airspace of NATO countries, and the military recently carried out snap drills in Russia’s westernmost region, Kaliningrad. This doesn’t look like a leader on the verge of de-escalating. 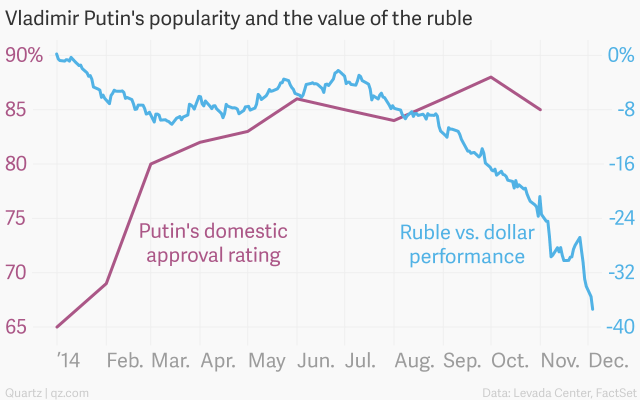 Despite the steady economic deterioration—as reflected by the tumbling ruble—Putin’s popularity at home has soared. Granted, the president’s approval rating slipped from 88% in October to 85% last month, but that will hardly ring alarm bells around the Kremlin. Putin says he wants to stay in power for another 10 years, and the recent polls show the he will probably experience little resistance in doing so. A survey yesterday (link in Russian) suggested that he would win more than 80% of the vote if he faced re-election today. Putin has explained the government’s strategy this way: The national budget is denominated in rubles, not dollars, and as Russia’s main export, oil, loses dollar value, the currency devaluation offsets the loss. This allows the government to keep its promises for social programs, in nominal terms. As imports drop, the theory goes, domestic producers will pick up the slack, and most Russians aren’t going to feel much of a pinch unless they travel outside the country or buy a lot of imported clothes, electronics and fancy foods. In any case, the people who do such things aren’t Putin’s biggest supporters. He relies on the poorer, older, more nostalgic and less educated electorate, which wouldn’t be hurt by the devaluation. The problem with these expectations, of course, is that Russia imports a lot of the most basic products. … Even lower middle class Russians will notice when they can no longer afford shoes, cosmetics, medicine or cheap electronics. The not-so-veiled chortling in the United States and elsewhere that lower prices will force changes in Russia is, therefore, premature at best. If anything, lower prices could lead to more xenophobia and nationalism, and more Russian aggression over Ukraine and natural gas to Europe as Putin finds other ways to maintain power and prestige at home. It also is leading Russia to attempt to build stronger ties with China, as a way to inoculate itself from vulnerability to Western markets and finance. And Putin surely realizes that commodities are a risky foundation. No one country can control prices and being dependent on commodities means that you are never in control of your own destiny. This recent shock is one more spur for Russia to make more of what it needs itself, if it can. Poroshenko told his cabinet to take steps within a week “to terminate the activities of state enterprises, institutions and organisations in the various territories where anti-terrorist operations are being conducted,” a statement on his website said. “This is a decisive step, the games have stopped,” the security official added. “All the structures that the state finances will be withdrawn from there. Ukraine will no longer finance them.” The decree also proposed that Ukraine’s central bank take steps over the next month to withdraw all banking services for businesses and individuals in the regions. In the decree, he asked the country’s new parliament to revoke a law granting self-rule to the Donetsk and Luhansk regions—in effect rescinding September’s “special status” law granted under a ceasefire allowing the two mainly Russian speaking eastern region some autonomy. The National Security Council recommended Poroshenko revoke the special status law following the November elections in the separatist Luhansk People’s Republic and Donetsk People’s Republic—polls that broke the conditions of the Sept. 5 Minsk ceasefire agreement. That ceasefire allowed for local elections in Donbas in December, but under Ukrainian supervision. 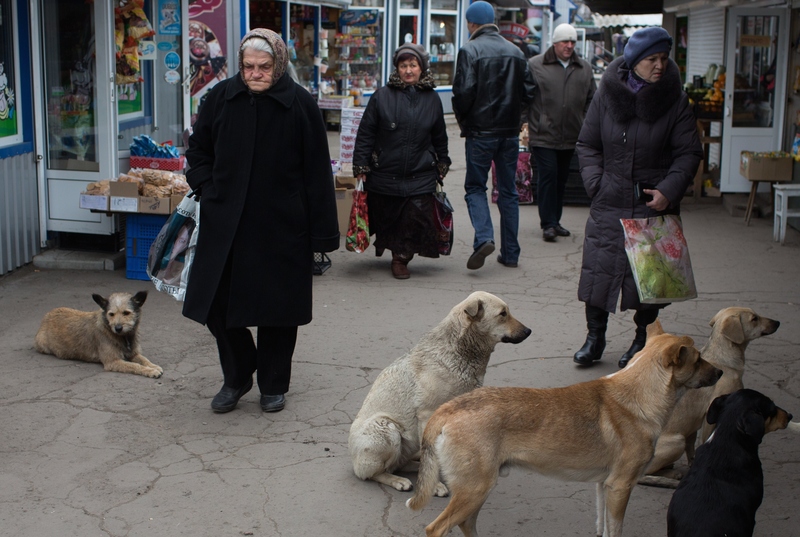 The separatist polls amounted to a direct challenge to Kiev’s authority. But the decision now to sever economic ties with the eastern regions was a surprise—and a gamble. Western leaders piled huge pressure on the Russian president at the Group of 20 meeting in Brisbane, with host Tony Abbott calling on Putin to “atone” for the shooting down of Flight MH17 over rebel-held eastern Ukraine and Britain’s David Cameron branding him a “bully”. Analysts said Putin’s apparent anger at his treatment by his fellow leaders could worsen the crisis in Ukraine. “If he is leaving irritated, just wait for the fighting in Ukraine to intensify,” independent analyst Stanislav Belkovsky told AFP. Putin, who prides himself on his stamina, cited the “need to sleep” and a long flight home as his reasons for leaving the summit before the final communique was issued. What were the Western leaders trying to achieve? Putin already knows they resent his meddling in Ukraine. Not inviting him at all would have sent a clearer signal that the West is prepared to isolate Russia from international decision-making, as it once did the Soviet Union. That message would have been misleading, however, because, despite Putin’s stubborn and increasingly ridiculous denials that Russia is taking action in Ukraine, the West still wants to talk with him: German Chancellor Angela Merkel, French President Francois Hollande, Italian Prime Minister Matteo Renzi and European Union President Jean-Claude Juncker, not to mention the leaders of BRICS countries, all held meetings with him in Brisbane. Taunts and angry looks only make such conversations more difficult. With reports of Russian troops and equipment pouring across the border with Ukraine that seem hard to deny, and the whole idea of showing up with a fleet of Russian destroyers in international waters off the Australian coast, much further from Russian waters than the Russian Navy tends to travel these days, certainly seems like more Putin-esque showmanship and provocation. It’s almost as if Putin went to Australia with the specific intention of creating a scene like this for propaganda purposes back home. In response to a question about whether Russia was arming the rebels, as contended by both Kyiv and the West, Putin said merely that “anyone waging a fight that they believe fair will find weapons.” He stressed that without such arms the rebels would be quickly destroyed by the Ukrainian forces – something Russia “does not want, and will not allow.” While Putin stopped short of acknowledging Russia’s material role in the conflict, his comments went further in emphasizing Moscow’s willingness to support the separatists than ever before.